“Well done Boris for issuing his first HIGH air pollution warning since launching his Breathe Better Together campaign on 30 January this year. “This episode, the third of the year so far, is being caused by collapsing wind speeds and a change in wind direction that is bringing in air from the continent that has passed over heavily urbanised and industrialised areas. Easterly winds look set to worsen the problem for West London as it gets smothered in everyone’s air pollution. Air pollution monitors across London are expected to report HIGH particle levels at roadside and perhaps some background locations later today. “Official health advice is that anyone experiencing discomfort such as sore eyes, cough or sore throat should consider reducing activity, particularly outdoors. At-risk individuals should take extra care and carry their medication with them today. The London Air Quality Network forecast, issued at noon on Tuesday 17 March, warned of worsening air pollution overnight with HIGH particle air pollution expected everywhere in London on Wednesday. Air pollution has short-term and long-term standards set for health and legal purposes. Short term standards for particle air pollution are being exceeded today. 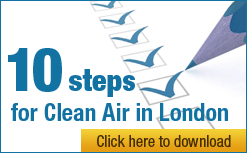 Annual limits for nitrogen dioxide, a toxic gas and the other main regulated pollutant, are breached year round across London with many roads in central London tending to have the highest concentrations in the world.